Do you really, truly love your customers? Most companies don't. They pay lipservice to customers - but everything in their procedures indicates they don't mean it. You can spot this in small things - the waitress at Center Parcs who insists that drink orders must be filled before food is ordered. In the face of hungry children, she does this because it is more important to satisfy her boss than her diners. Or take the beleaguered shop assistant in the Heathrow Harrods. It takes her twenty-five minutes to do a price check - twenty-five minutes in a store full of people catching planes - because computers work slowly on Sundays and keeping the computer records flawless is more important than purchasers catching their planes. Worst of all, perhaps, is British Airways whose aggressive signage warns us not to abuse their staff - with no recognition that any desire to abuse staff derives from customers having been abused by BA in the first place! Get the Sessions from the Silicon Valley Conference! 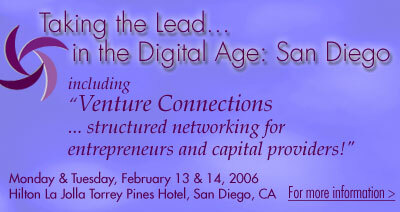 Follow up on a session you missed at WITI's 2005 Silicon Valley Conference. Revisit a session you attended for more information. Or celebrate again the accomplishments of the WITI Hall of Fame 2005 Inductees. CDs and DVDs are available at WITI's website..
How will I know the right decision to make? When will I know the right time to make my move? You find yourself thinking about making changes, researching and analyzing all of the "facts" that you can get your hands on that relate to the area of change you are considering, but you feel no closer to answering the above two questions. You feel frustrated and lost, maybe even desperate. You want to know the answers and you want to know them now! Looking for your next big opportunity? Add your resume (confidentially if you wish) to WITI 4HIRE today! As a career coach and professional resume writer, I'm often asked "How important are cover letters to my job search?" My answer is, "It depends on how long you want to search for your next job." If you are in no hurry to get interviews, then don't worry about your cover letter. The fact is I've never met a job searcher who wants to have a painfully slow job search. The whole point of sending out resumes is to get multiple interviews as quickly as possible. But many job seekers still unwittingly sabotage their efforts by using substandard cover letters. Instead of helping you, your cover letter may actually be hurting your job search. WITI Member conducting research: "Does the CEO/CIO Disconnect still exist?" The disconnect theory was first coined by Charles Wang in his book Techno-Vision. The nineties were filled with studies purporting strategic alignment. The CEO and CIO have to be on the same page. Information technology is a support function of the business and should not be perceived as just a cost center. CIOs were to join ranks of the other C level executives in the high level organizational strategic planning sessions. But around 1998 the disconnect disappears from the literature. The hot topics are eCommerce and the dotcoms. But did the disconnect disappear with the absence of reference in the literature? This research study will examine whether or not the disconnect still exists using Dr. Jerry Luftman's Strategic Alignment Maturity Assessment model. A survey URL will be placed in the discussion board on the WITI website for anyone who is interested in participating in this research study around mid-January. The survey is completely anonymous. Karen Steede-Terry has a new book, Full-Time Woman, Part-Time Career. Not everyone is well-suited or finds appealing the sales positions commonly offered to women looking for flexible yet professional career options they can pursue from home after they have children. Karen's book is a resource for career-oriented and technical women who want to keep their career, and go into consulting, freelance writing, coaching, teaching software, etc. after they have a baby. It is a "how-to" guide for professional women who want to build their own business. Karen says, "I wrote it because I have been self-employed in a high-tech (GIS/GPS), mostly male field for almost 10 years now. Over the years, I have had numerous women approach me for advice about going out on their own. They all wanted a flexible career while they raised kids, and I realized there weren't any resources available for women in that situation." Dr. Laura Schlessinger (Nationally Syndicated Talk Show Host and Bestselling Author) has said, "Full-Time Woman, Part-Time Career is a wonderful book for women who are looking for alternatives to returning to the workplace after having children. It helps professional women struggling with how to have a career that does not interfere with family. This is a perfect, perfect book!" And Lois P. Frankel, author of the national bestsellers Nice Girls Don't Get the Corner Office and Nice Girls Don't Get Rich, has said "If you're tired of hitting your head against the glass ceiling, this book will give you a gentle nudge in the right direction. It's filled with great ideas, tips, and stories to help you start your own business." WITI congratulates Karen Steede-Terry on her new book and the excellent reviews! For a special offer on Full-Time Woman, Part-Time Career, go to www.fulltimewoman.com/special_offer.html. 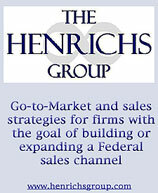 The Henrichs Group, LLC is a sales and marketing consultancy which provides Go-to-Market and sales strategies to firms with the goal of building or expanding a Federal sales channel. The Henrichs Groups customized solutions provide clients access to a seasoned team of sales and marketing professionals experienced in sales strategies, brand management and marketing, business development, channel strategies, and contract management and support.